When our class graduated from university some of the girlies organised leavers hoodies for us. I wore mine pretty much non-stop with my jeans as it was so warm and comfortable. On the front it has the university logo on one side and on the other side it says “Smithey”. In m y class at university there were three Hannah’s so we all had our own nicknames, I was Smithey, Hannah Two was Kewey and Hanna Three was called Greavesey (but I think she stayed as Hanna and me and Kewey adopted nicknames). 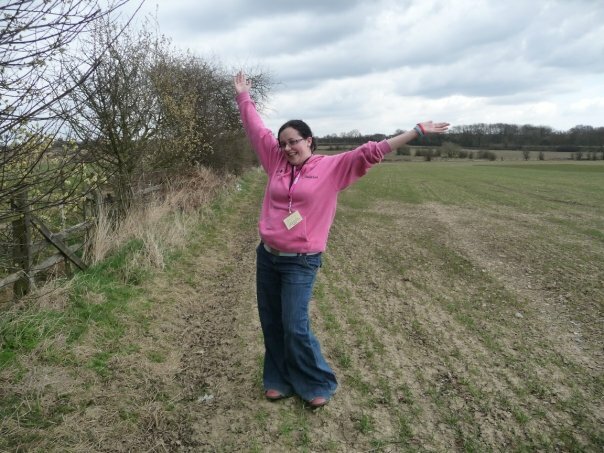 The picture below showing off my jumper was taken at Swanwick in 2009. Me and Chris had been married for two years and he was attempting to write his dissertation for his course. This particular afternoon I went to explore the local area with The Murf, Caz and some other friends from church. The other side of the fence there was a railway museum of sorts that I thought that my Dad would really like. I think that if I can’t wear it any more for any particular reason I might sew up the arm holes, neck holes and waist band and make it into a cushion or something like that so I can still use it. What do you think? Thank you – my friend Caz took the picture while we were off on our adventure – there are quite a few random pictures from that day – including one of me and two friends balancing on rocks doing the grasshopper move from the Karate Kid. That’s an awesome idea! I should do that with all the hoodies I acquired while in college. I love hoodies!! I would live in them if it was appropriate for all occasions! I still have a t-shirt that we made the whole class back in high school. I forgot about it until I read your post. Thanks for bringing back some good memories. The cushion idea is great! But hopefully you’ll be able to get a lot of wear out of it yet. I hope so! I haven’t worn it in a while but I think I might dig it out if the rubbish weather carries on around here – it’s July but the weather says April or Winter (well minus the temperature it’s too warm for Winter but it’s been raining and cloudy like winter). I need some sunshine!!! I’m always saving stuff like this and hoping to someday make or commission a quilt out of it all! A quilt out of old hoodies and shirts would be amazing. There’s a company on FB (Katwise maybe but I’m not 100%) who make amazing jumpers out of old hoodies and sweaters.